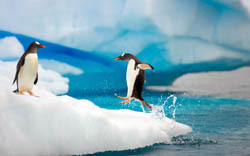 The Google Penguin 2.0 update was released on May 22nd. With this update to its search engine, Google is targeting black hat SEO techniques. Think spam links and paid backlinks. Hack sites are targeted as well, and better tracked. Build and release HIGH QUALITY content on your site(s) that users want, bookmark to return to, and can employ and your site will be fine. Social signals are becoming more and more important for Google search ranking. The Google Penguin 2.0 update means that if people actively engage with your web site and content on social platforms, your site will end up higher in the results. Hooray for those with a strong social following. Boohoo for those who had worked harder on backlinks than social. – Lots of backlinks might hit you back, either paid/spam or not. – Advertorials? Make it clear to visitors that they -are- looking at advertorials. – Social signals have more influence on results. Do some community building, and keep at it! Here’s a German victim of the Google Penguin 2.0 update, which sunk in the Google SERPs because paid/spam backlinks to their web site.